A/N: Much thanks to Jordan. Again! You’ve been a wonderful mentor in this fandom. Wiping his hands on the bloody rag, Nathan shook his head. Never had he seen a man lose so much blood, yet keep fighting. But then, Chris Larabee wasn’t a normal man. He was stubborn as hell and it was all Buck and Vin could do to hold him still while Jackson stitched the gash on his forehead. “Damn.” Vin grunted as he held the blond gunfighter’s shoulders down. “You musta pissed off the wrong crowd this time.” Larabee ignored the comment, and kept trying to come up off the table. Jackson grinned. “How did you come about this hole in yore head, Chris?” Nathan asked as he pulled the needle through the skin once more. Chris closed his eyes, and thought about the events of the past few days. It had been a day like any other. That is, until he saw a rider leaving town in an awful big hurry. He mounted Pony and took off in the same direction. A couple of miles later, he caught up to the fleeing figure. They had made camp and had a small fire going. Looping the horse’s reins around a low-hanging branch, he drew the Peacemaker and made his way silently to the stand of trees to the left of the makeshift camp. Leveling the gun in the direction of the fire, he opened his mouth to call out to the occupant, when a sturdy limb caught him above his right eye. Staggered by the impact, he fought to stay upright and hold onto his weapon. Another blow to his ribs knocked the wind out of him. Gasping for air, he looked for the unknown assailant, but had no luck finding him. Darkness claimed him as a boot connected with the side of his head, and he crumpled to the ground. Opening one green eye, Chris quickly shut it against the bright noon sun. Taking a deep breath, he regretted it immediately. Pain sliced through his midsection and he clinched his teeth. Taking a more shallow one, he stood. Running a hand through his blond hair, he cursed when his fingers moved across the gash. The sound of voices startled Larabee into action. Ducking behind a stand of trees, he felt for his gun, and uttered a vicious oath at finding it gone. “JD, are you sure we’re headed in the right direction?” Chris riding out of town for a couple of days was no cause for alarm. But on the fourth day with no word from him, and Vin and Ezra having made a ride by his place with no luck, worry started to tug at the back of Buck‘s mind. When Mrs. Potter told JD that she saw Chris ride out of town a few days earlier like something was chasing him, Wilmington knew that something was amiss. “Yeah, Buck.” Dunne replied in an irritated tone. “This is the way Mrs. Potter said she saw him ride.” They rode on in silence, each searching the sparse landscape for any sign of Larabee. Buck pulled up on the reins, frustration beginning to set in. They’d covered at least five miles already with no luck. Then he saw a sight that made his heart sing and hurt simultaneously. 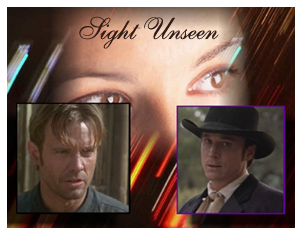 Buck was off his horse and at Chris’ side just as the blond gunfighter slid to the ground. “Easy there, Stud.” Lowering his friend to the grass, Buck hollered at JD to bring a canteen. Raising Chris’ head, he let a few drops fall onto his parched lips. The tepid liquid was like ambrosia to Larabee, and he reached for more. Buck pulled the canteen away and handed it back to JD. Pulling the scarf from around his neck, he carefully wrapped it around Chris’ head. Wishing like hell he’d kept Ezra’s flask this morning, Buck grimaced as Chris moaned at the movement of his head. After securing the rag, Buck stood and walked over to the horses, out of earshot of the blond lawman. Buck watched JD until he was out of sight, then went back over to where Chris lay, now unconscious. Dropping to the ground beside Larabee, Buck watched as his friend fought some unknown demon in his sleep. When the blond regulator began to tear at the cloth wrapped around his head, Buck took hold of his hands, pulling them back down to Chris’ side. “Easy now,” The ladies man said gently. “Nathan’s gonna be here soon and he’ll put a decent bandage on your wound, Stud.” Where was JD with Nathan? There was only so much he could do to help the man, and he’d pretty much exhausted his knowledge. “Reckon what’s got into the kid?” Vin was leaned back in a chair in front of the Standish Tavern. Dropping the front legs of the chair to the wooden porch, he stood and joined Ezra as they waited for JD. Dunne’s face was flushed from the ride back into town. He pulled up on his reins and called to the two men in front of the drinkery. Taking a gulp of air, he looked around for the healer. “It’s Chris. He’s bad off.” Spotting Nathan and Josiah coming out of the general store, he dug his heels into the horse’s flanks and took off to meet them. “C’mon, Nathan!” He hollered. “Chris’ hurt real bad and Buck’s with him but I don’t think-” Josiah took hold of JD’s reins and held tight. “Now, John Dunne,” The ex-preacher said in a soothing tone. “Tell us what happened.” JD gave an exasperated sigh and repeated what Buck had told him. Nathan and Josiah ran for their horses, joining Ezra and Vin who were already mounted, and the five men headed out of town. Buck watched helplessly as Chris relived some nightmare known only to the blond lawman. The sun would be going down in a couple of hours, and he wondered where in the hell JD was with some help. Shifting his weight to his right hip, he pulled his jacket off and laid it over Chris. The wounded gunfighter had begun to shiver and Buck tucked the garment tightly around Chris’ shoulders. The thunder of hooves and jangling harness brought Buck’s attention to the arrival of the rest of the group. Standing, he walked over to the men, shaking his head. “How’s he doin’?” Nathan pulled his satchel from his saddle. Nathan hurried over to Chris, dropping to the ground beside him. A glimpse of green showed through slitted eyes, but when they finally opened, they were bright with fever. Jackson turned Larabee’s head to the right to better assess the wound, but the gunfighter fought against the movement and attempted to push Nathan away. The quiet words were barely audible, but Nathan heard them clearly enough. Sitting back on his heels, he was trying to figure out the best way to get some herbs into the disoriented man, when Ezra quietly made his way over to the healer, and offered his flask. At the look of confusion on Jackson’s face, Standish reached for the small brown bottle in Nathan’s hand, and poured the contents into the silver container. Shaking it gently, he placed held it out to Nathan. Jackson took the flask, and waited for Ezra to help him raise the blond man’s head. Standish positioned himself at Larabee’s head, lifting his shoulders gently into his lap. Nathan tipped the flask to Chris’ lips, only to have the gunfighter knock it away. “Don’t want that poison.” Chris slurred. Nervously licking his lips, Ezra leaned down and spoke in soothing tones to the man. To the surprise of the men gathered around, Larabee opened his mouth and took a couple of swallows. Ezra eased him back to the ground, an odd expression on his face. Standing, he began to walk away when a hand on his arm stopped him. Looking down, he saw Nathan nod and smile at him, mouthing a silent ‘thank you’ to the Southerner. Buck nudged Vin, motioning toward the retreating confidence man. “He can be the devil in fancy britches, but that man yonder could sweet-talk a working girl into paying him for her favors.” The tracker smiled in agreement, before walking over to join Nathan at Chris’ side. “We need to get him back to my clinic, Vin.” Nathan stood and wiped his hands on his pants. “Can he ride?” Tanner asked the healer. Nathan shook his head. A ride back to town on a horse could do more harm to the already wounded man. But the sooner they got him back to the clinic, the more he could do for Larabee. To Chris, the darkness was serene. In it, there was no pain, no loud noise and the bright light didn’t burn his eyes. But something was disturbing his peacefulness. A voice, no, several voices. Why didn’t they go away and let him be? Troubled green eyes fluttered open, then slid closed once more. He was moving and the motion threatened to bring up the whiskey that Ezra had cajoled him into drinking. Vin and Ezra gently handed the semi-conscious lawman up to Buck, then helped him situate Chris as comfortably as possible in the saddle. Wrapping one arm around his friend, Wilmington nudged his horse forward. Despite his best efforts to make the ride back to town as smooth as he could, the dirt road was unforgiving, jolting Larabee with each step the animal made. Larabee stilled and his head dropped to his chest. “Chris? Hey buddy, you alright?” Buck pulled back the reins and waited for Nathan to ride up. Jumping off his horse, the healer came over to check on the gunfighter. Focusing all his energy on controlling his trembling hand and staying upright, Chris was unaware of Josiah moving up behind him. The preacher wrapped his arms around the blond lawman, knocking the gun away. Buck approached the pair slowly, noticing the look in Chris’ eyes; the look of a wounded, trapped animal trying to figure an escape from its captor. “Sorry, Stud.” Buck said in a low voice. “This is for your own good.” Enraged green eyes bored into miserable blue ones, and then Buck swung. Larabee sagged in Josiah’s arms, all the fight gone from his limp body. Buck mounted his horse, then waited as Chris was handed up to him once more. The ride back to Four Corners was without incident, and when they arrived at Nathan’s clinic, Vin and Josiah carried the blond up the stairs and put him on the bed. Nathan gathered clean bandages and a basin of water and carbolic. He knew he had to work quickly, because when Chris came to, he was gonna be madder than a grizzly bear. He gently pulled the tattered black shirt off of the pale skin, then set about washing the blood and dirt off of the man. When he reached Larabee’s wrists, he took a deep, bracing breath and cleansed the dried blood from his wounds. There was dirt embedded in the lacerations, and he knew that if he didn’t get all of it infection would set up in the gashes. Buck sat in a chair in the corner of the room. The others had left after seeing that Chris was in good hands and Nathan didn’t need them, but the ladies man had refused to go with them. “How is he?” The soft question brought Nathan’s attention away from the blond in front of him. Buck’s blue eyes were filled with concern, and Nathan carefully considered his words before answering. Standing, he left the clinic and joined Josiah and Vin at the bottom of the stairs. “Any change?” The Texan asked. The hot sun beat down on the crown of the gambler’s black hat. He squinted his green eyes as he scanned the land in front of him. Granted, he didn’t possess Mister Tanner’s gift for tracking, but he’d had moderate success in finding things, people that didn’t want to be found in the past. And his intuition was telling him he was on the right path now. Lost in his thoughts, he didn’t notice the figure leaning against an outcropping of rocks to his right. The buckskin covering the barrel of the rifle prevented any kind of glare from the sun, and Standish was only aware of their presence when the bullet tore into his side, knocking him from his horse. Contact with the hard ground ripped the breath from his lungs, and Ezra was stunned for a few seconds. Survival instinct kicked in, however, and he scurried behind a stand of trees. Drawing his pistol, he looked for the location of the shooter, but the pain of the wound and rapid blood loss blurred his vision. Wiping his good arm across his face in hopes of clearing his sight, the gambler searched the rocks opposite him. Nothing. The second shot hit the tree near his face, sending a deluge of debris into his face and eyes. Blinded, he fell back, clutching his Remington tightly. Closing his eyes, he panted frantically as he tried to think of his next move. He was wounded, alone, and now he couldn’t see a damn thing. Having read in a book that when one of your senses is impaired, the others become sharper, he listened for any sound that might be of use in his escape. Maybe it would have been wise to allow Mister Dunne to accompany him, but he had refused the young man’s offer. Now he was in quite the predicament, and could only hope that whoever had fired on him was long gone. Lady Luck had smiled on him before, but she could be the fickle wench when she so chose. Pushing himself up off the ground, he leaned against the tree for support. Taking his handkerchief from his pocket, he briefly considered covering his eyes with it. But if the shooter was still out there, why let them know the considerable advantage they held? Soft footfalls sounded from Ezra’s right. Lifting the pistol, he aimed in that direction. “Who’s there?” he asked quietly. Ezra stumbled and Lillie wrapped her arm tighter around him, taking care to avoid his injured side. “You still haven’t told me your name.” Lillie smiled. The exhausted gambler laid his head back, feeling his strength waning. His thoughts were interrupted when Lillie came back into the room. Sitting down beside Ezra, she sat her pan on the floor and soaked a cloth in the cool water. Gently, she patted the soft material over his injured eyes, taking care not to do any further damage. “I think your eyes will be just fine, son.” She rinsed the cloth in the pan once more, then set about removing Ezra’s jacket. He tensed as she pulled the linen shirt free of his pants, the blood from the bullet wound having dried and plastered the garment to his skin. A strange expression crept into Lillie’s eyes as she saw the hole left by the bullet. Her hands balled into fists, and she blinked back tears. Tenderly, she sponged the wound, speaking to Ezra in a soothing voice as she did. The sadness in her voice kept Ezra from inquiring as to the whereabouts of her son. But something in her tone gave him pause; just that little quirk of doubt that put all his senses on alert. The temporary blindness was beginning to abate, and Ezra could see shapes and patches of light. However, he didn’t let Lillie know this. He had a bad feeling that he was going to have to draw upon his past experience as a con man to get out of the situation in which he currently found himself. Buck spit out the mouthful of coffee he’d just sipped and dropped the front legs of the chair back to the floor. “I do believe Brother Chris has come back to us, boys.” Josiah stood and waited for Nathan to open the door, just as the metal basin sailed past. The well-aimed projectile narrowly missed the healer’s head, crashing against the wall. This brought a smile to Buck’s lips. Chris would be fine. He wasn’t sure about Jackson. Nathan cautiously approached the irate gunfighter, holding out a hand in supplication. “Chris, you keep this up and I’m gonna have to stitch you up again.” Larabee glared at the men entering the room. “Which one of you was it?” Chris growled, rubbing the bruise on his chin. Green eyes shot daggers at his friend as Larabee eased back down on the bed, turning his head toward the opposite wall. Bits and pieces of his memory were coming back, but he didn’t let the other know that he couldn’t remember what had happened to him or who was responsible. Buck, Josiah and Nathan exchanged silent glances, unaware that Chris was watching. Something was wrong here. He remembered JD coming in earlier; kid never knew when to stop with the lame jokes. But he knew they covered up the young man’s nervousness. Vin had stopped in as well. Ezra, however, was conspicuously absent. Turning back to face the three men gathered in Nathan’s clinic, he asked if the gambler was on patrol. Three guilty faces avoided looking directly at him. Looking from one man to the other, he knew they were keeping something from him. Buck was the first to speak. “Now, pard,” he began. “It ain’t nothing like that. At least we don’t think it is.” He looked to Josiah for help. The ex-preacher offered a helpless shrug. The wounded lawman’s eyes slid shut once more, but the tension still held his body rigid. The defeat in Larabee’s voice echoed loudly in the small room. Josiah sat down in the chair beside the bed. “Brother Chris, I don’t think he‘s running this time.” Sanchez’ voice was calm. No one noticed the tracker had entered the room and stood quietly, listening to the conversation. “He ain’t runnin’, Chris.” Vin said calmly. “I followed his trail this morning. He was looking for whoever did this to you, and he musta found them.” Pushing himself off the frame of the clinic door, he walked over to where Chris lay. I truly am caught between the Scylla and charybidis, Ezra thought to himself. Damned if I do, dead if I don’t. Placing the glass to his lips, he took a small swallow. Swishing the liquid around in his mouth, he tried to detect the presence of anything foreign. Tasting only what might possibly be the best brandy he’d come across since he arrival in this backwater, he tipped the glass up and downed the remains. Rising from her chair, Lillie took the glass and returned to the kitchen, coming back with a refill for the Southerner. Only this time she had a glass for herself. “To good health, my precious.” She raised her glass in salute, before turning it up and draining it. Ezra followed in kind. The liquid was smooth going down. It reminded him of a bottle of single malt scotch that Maude had sent him a while back. Granted, that bottle had not lasted long. He made the mistake of opening it in the saloon, and Buck guzzled the majority of the liquor like a dying man would water. He was still sore at the rogue for that little incident. Ezra blinked and was pleased to find that his sight was coming back to him. He could see Lillie as she sat beside him, a faraway look on her face. She was much younger than he’d imagined from the sound of her voice. Her porcelain skin was unblemished and silky blond hair framed her face. He guessed she was close to his own mother’s age, maybe a bit younger. Limpid brown eyes sat atop a patrician nose, and below that a full mouth with a cupid-bow upper lip. She was a lovely woman, but there was something about her that wasn’t quite right. Her features began to blur, and he felt the room start to spin. Closing his eyes, he shook his head slightly. When he opened his eyes once more, she was leaning over him, staring at him as if he were something new and wondrous she’s only just seen for the first time. Lillie eased him down, then lifted his legs off the floor and placed them on the pillows at the other end of the couch. Ezra didn't want to rest. In fact, what he wanted more than anything was to make a hasty retreat. Lillie had helped him, at a time when he most desperately needed it, but he had a strange feeling her kindness was going to cost him -- perhaps more than he was willing to pay. He cracked an eyelid when she began 'tucking' him in. On it's own such an act would have been delightful, considering he had no memory of ever having been tucked in before, not even by his own mother. But her attention was unnerving and for the first time in his life he found himself wishing his mother were here to teach Lillie a thing or two about the dangers of caring for strangers. A new day dawned, and Chris was still not in the most amiable of moods. He’d lain awake last night, thinking of the announcement that the soft-spoken tracker had made. Where in the hell was Ezra? Deciding that he was the one who should go find the Southern scoundrel, he threw back the covers and was intent on getting dressed and going to look for Ezra himself. The door to the clinic opened, and Nathan backed in, arms loaded with a tray of food that Inez had prepared for the healer and his patient. Turning around and sliding the door closed with his foot, Jackson shook his head at the sight that greeted him. Green eyes narrowed at the meaning behind Nathan’s words. He knew that Nathan meant what he said, and that he would have Buck come slug him again, so with a resigned sigh, he lay back down and pulled the covers over him. But he made sure that Jackson knew his opinion of bossy friends and friends who would resort to physical violence to get their point across.